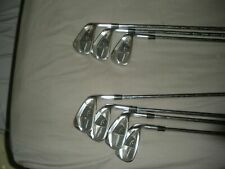 CALLAWAY APEX PRO '16 FORGED IRONS (6-PW) Tour Issue DG X100 Shafts +1/2"
Tour Issue Callaway Apex 16 Pro 20 Irons 3-PW DG Tour Issue x-flex AWESOME!!!!! Tour Issue Callaway Apex 16 Irons 3-AW Pured Aerotech Steelfiber 110i SWEET!!! Tour Issue Callaway Apex 16 Pro 20 Irons 3-PW Aerotech Steelfiber SWEET!!!!!!!!! This page was last updated: 25-Apr 21:11. Number of bids and bid amounts may be slightly out of date. See each listing for international shipping options and costs.